I don't seem to have found my crafting rhythm again yet since the children have gone back to school. The youngest is only doing two and a half hours of a morning until November, which is rather less than the three full (school) days he was getting at nursery and I spend my mornings frantically trying to fit in as much domesticity as I can so that he can have my attention in the afternoon. I have also been painting the bay windows at the front of the house (inside and out) but it has been tricky to fit this around everything else with the added element of the weather. For a few weeks all my stuff was left in an awful muddle because I just couldn't get around to sorting it all out. 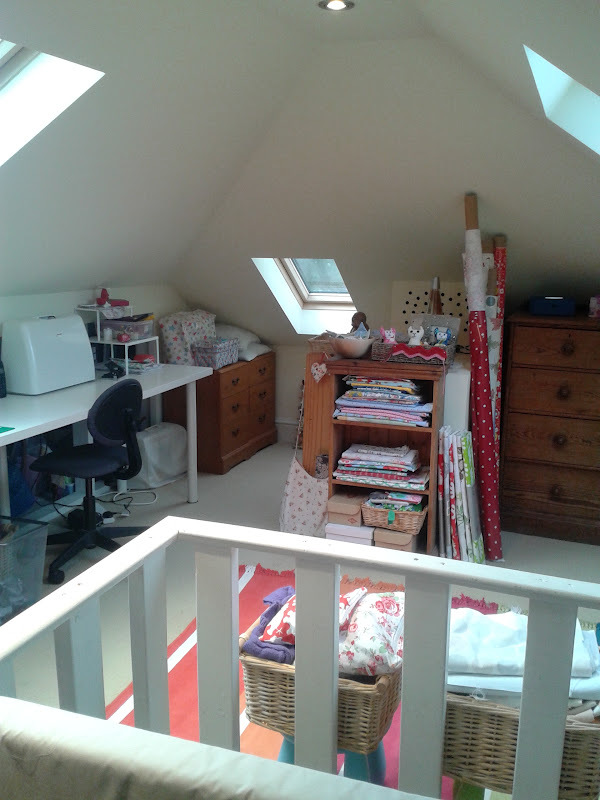 The fact that this room is in the attic, and is accessed by a fold-down ladder which is only out when our time-share teenager is here means that it is very easy to ignore a mess as nobody can see it. The need to get my sewing machine out and make some things for the SnB swap I'm participating in necessitated a quick tidy but there is still lots to do. You can't really tell from the pictures, but there are several large Ikea bags stuffed behind the desk in the eaves space that need to be sorted out. Also when Mr Magpie brought my white drawer unit up, it got turned on it's side. I'll let you use your imagination as to the state of the drawers, in which I keep all my tiny oddments including needles, beads, ribbons and lots of other small objects. Picture, if you will, some kind of haberdashery soup and you'll get the idea. Still plenty for me to be getting on with before I can relax into creation up here. 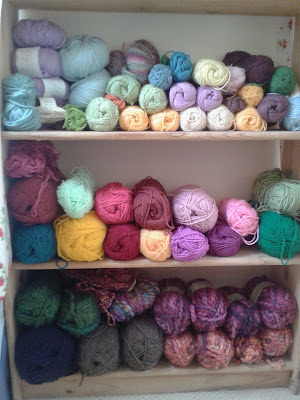 I know that this yarn should really be packed away from moths and sunlight but it looks so pretty! Just out of interest, this is the other side of the room. 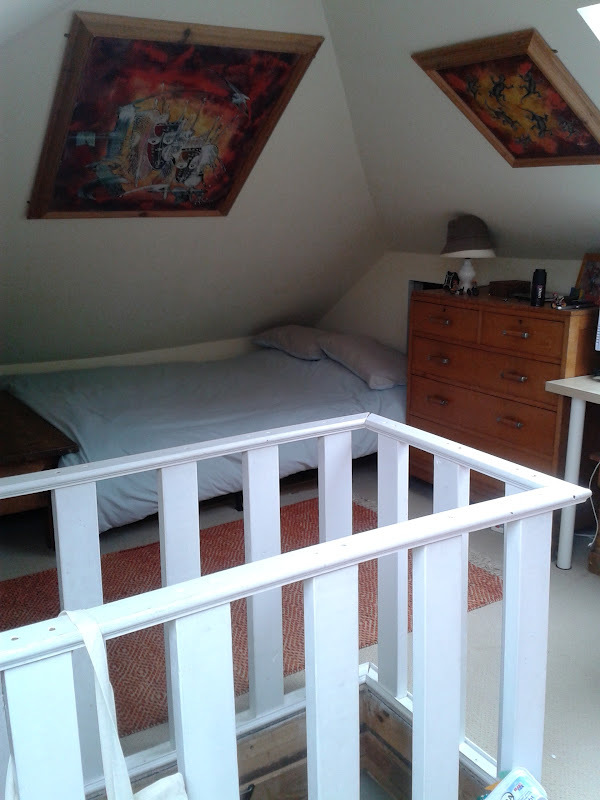 The bed is a double, so you don't really have to sleep squashed under the eaves, although I have done exactly that on occasion (sometimes we sleep up here when family comes to stay, we frequently play musical bedrooms in this house). I'm actually getting quite excited about the SnB swap. It's the first time I've ever done one and I can already tell it won't be my last. This is a 'round robin' swap, consisting of five rounds. Every few weeks we pass the bags along having placed in our item for that round. There are five rounds altogether. Week one was yarn, week two accessories, last time it was a pattern and this week a handmade item (hence the need for me to sort out the craft space). The last item is something edible or drinkable. 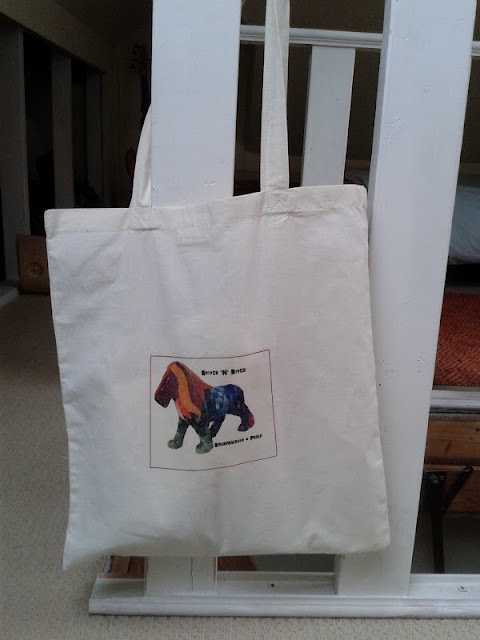 None of us know who is getting what for who and the rounds mean that we get to choose things for five different people and our own bags will be a deliciously varied mixture, but hopefully chosen with the recipient in mind. I can't show you what I have made for the handmade round until the swap is completed but it was something new for me and I may now have to make something similar for myself. My knitting is coming along well and will hopefully be finished soon. I even found some foam blocks at a charity shop last week which I'm reliably informed are brilliant for blocking on (more on that another time). My Smoothie-hat knitting also got me thinking about trying to knit some hats for the Magpies again (questionable results achieved last time a few years back). 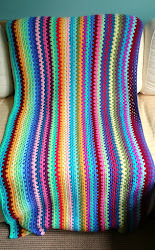 I fancy trying to knit 'in the round' and need to have a play with some different techniques. If anyone has any advice I'd love to hear it. I'd also like to hear about any other hat disasters because it will make me feel better. Oh my, your attic is so similar to ours it's spooky! We do have stairs up to ours with a mezzanine sewing/junk area and a teen bedroom, but lots of ducking under the eaves etc......great bonus space we find. I'm eyeing up your fabric! Hope you get some time soon...that one coat fiddly painting, clean brush, wait 16 hours and 8 days cos it's raining lark is a pain..hope the jobs are done soon so you can make for pleasure again. 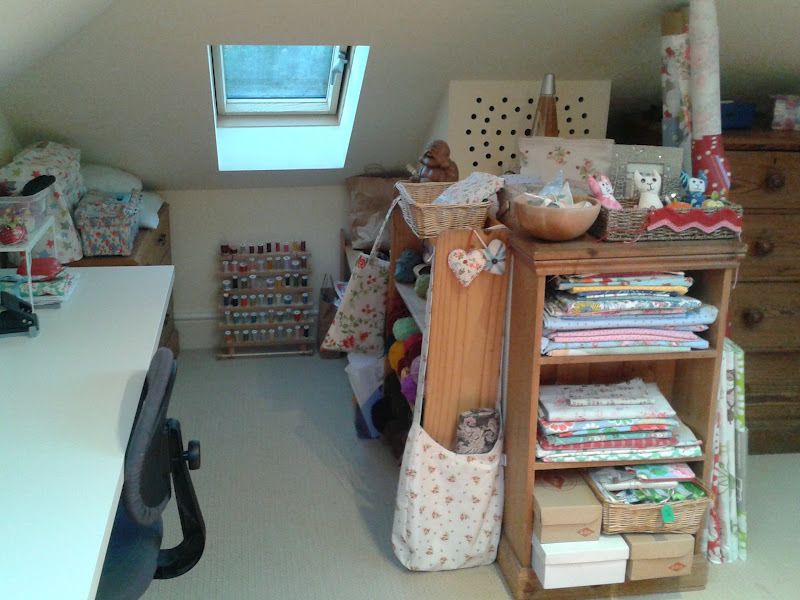 What an amazing crafting space! I'm super jealous:) It's even more perfect for the fact that you can "hide" it away if it gets too messy! PS: I'm still drooling over your yarn stash. It looks amazing! Can I come for a rake?! That's one heck of a tidy up. 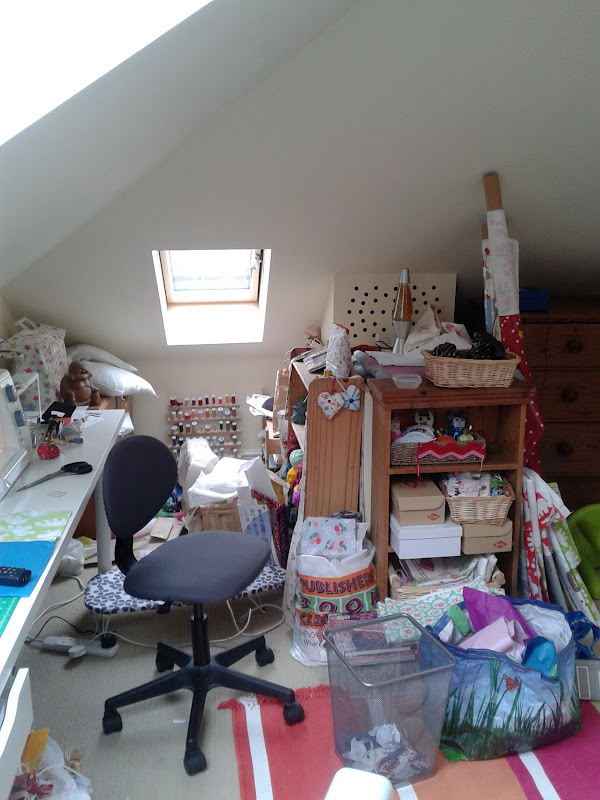 Can you come and work your magic on my sewing/dining/hoarding room?! I hope you don't mind but I've just 'tagged' you on my blog. If you don't want to play I wont be offended. I've never bothered before but it's been such a dismal day here!